The United Nations Development Program in the Russian Federation has presented, in one of the most beautiful exhibition halls of the Tretyakov Gallery which is devoted to Valeri Vrubel, its 2001 Human Development Report for Russia. As with the six previous reports, this one is not an overview of the socioeconomic situation in 2001, but actually an analytical study undertaken from a scientific point of view. The central theme of this year's report is human development across the generations. Most interesting is the data featuring the generations from a regional perspective. According to the research, out of eighty-nine regions of Russia the highest human development index is in Moscow, Tyumen Region and Republic of Tatarstan, and the lowest ones are in the Chita Region and Republic of Tuva. 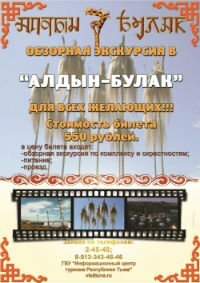 Today the International Khoomei Festival Dembildey 2002 is beginning in Kyzyl. Thirty-five participants from all over the world are taking part in it. The festival will last three days: on the first they will parade from the Centre of Asia Monument to the Drama theatre; on the next day a competition of throatsingers in solo and ensemble categories will be held; and on the last day (June 30) a sports and cultural program is planned, including horseraces, wrestling and a night-time jam-session of all the participants of the Dembildey Festival. Also on this day, one of the organizers of the festival, Kongar-ool Ondar, will celebrate his birthday.